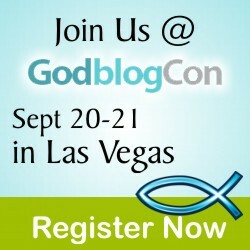 GodBlogCon - My wife and I will be there! On July 17th, a group of Christian Bloggers will begin reading together, and sharing thoughts on-line, Jonathan Edward's "A Treatise Concerning Religious Affections". I have ordered the book from Amazon. 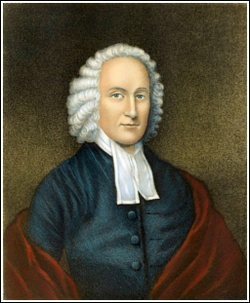 But while I am awaiting its arrival, I have started reading the text on-line at Yale University's "Works of Jonathan Edwards Online". While trying to decide if I was going to make the commitment to read this demanding text, I wanted first to have a basic understanding of the intent and context of the text. Following, you will find my notes on the preface of Jonathan Edward's, "A Treatise Concerning Religious Affections". 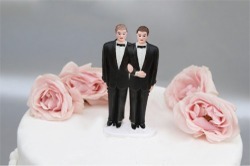 Phoenix, Arizona - after hours of angry and racous debate, the Arizona Senate passed a measure to put a ban against "gay marriage" before the voters this coming November. "ONLY A UNION OF ONE MAN AND ONE WOMAN SHALL BE VALID OR RECOGNIZED AS A MARRIAGE IN THIS STATE." This will undoubtedly make for some interesting debate in the coming months for Arizona residents. Here is a link to a variety of lectures, from John MacArthur's Master's Seminary, on "The Truth about Homosexuality". These would good resources, for Christians, to get clear on the Bible's stand on these issues. Pew Study: Do Arizona residents believe there is "one" true way to heaven? The Pew Forum on Religion & Public Life just released the second installment of the U.S. Religious Landscape Survey. This is my third installment as it relates to Arizona residents and their faith beliefs. This particular question, from the Pew Survey, asked Arizona respondents regarding their religion being the "one true faith". Question wording: [IF RESPONDENT HAS A RELIGIOUS AFFILIATION, ASK:] Now, as I read a pair of statements, tell me whether the FIRST statement or the SECOND statement comes closer to your own views even if neither is exactly right. First/next: My religion is the one, true faith leading to eternal life, OR: many religions can lead to eternal life. Their religion is the one, true faith leading to eternal life. Many religions can lead to eternal life. Out of the 35,000 people that responded to this survey on a national basis, only 578 residents of Arizona responded to the questions. With this question we find that we have only 452 responses as only that number said that they had a religious affiliation. I suppose this small sampling might raise a question, but as we can see, it is not far from the national responses. Post-modern America and Post-modern Arizonans, as a rule, do not believe that there is one true faith that leads to heaven. "There is no question whatsoever, that is of greater importance to mankind, and what is more concerns every individual person to be well resolved in, than this: What are the distinguishing qualifications of those that are in favor with God, and entitled to his eternal rewards? Or, which comes to the same thing, What is the nature of true religion? And wherein do lie the distinguishing notes of that virtue and holiness that is acceptable in the sight of God? But though it be of such importance, and though we have clear and abundant light in the word of God to direct us in this matter, yet there is no one point, wherein professing Christians do more differ one from another. It would be endless to reckon up the variety of opinions in this point, that divide the Christian world; making manifest the truth of that declaration of our Savior, "Strait is the gate and narrow is the way, that leads to life, and few there be that find it." Perhaps there is...nothing new under the sun. Tim Challies is starting another "reading Christian Classics" in a few weeks. We just finished A.W. Pink's "The Seven Sayings of the Saviour on the Cross" and I found the book to be profound. This reading project will be Jonathan Edwards "A Treatise Concerning Religious Affections"
This is 350 pages of pure unadulterated Kolbe beef. Pure meat! It will be a very enlightening read and one that will span quite a period of time. I just finished listening to Dr. Steve Lawson give a one hour lecture on the life of Jonathan Edwards which I would highly recommend. 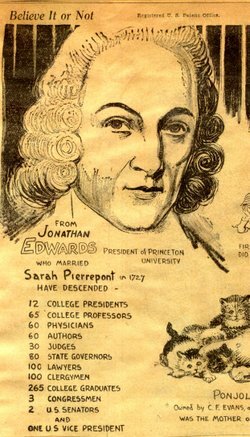 I have heard of Jonathan Edwards, but I really didn't know much about his life. Some have said of him, that he was the most brilliant man to ever have lived in the United States. He was also a key figure in "The Enlightenment", which was a large revival back in the 18th century. He attended Yale at age 13 and was clearly a brilliant theologian. If you want to stretch your mind a bit, and desire to seek God's presence, then I invite you along with us on this journey. Pew Study: Do Arizona Residents Believe that the Bible is Literally God's Word? This is my second installment as it relates to Arizona residents and their faith beliefs. Here we find the folks at the Pew Forum asking about the Bible. Do people, and Arizonans in particular believe that the Bible is God's word and do they believe it is true word for word. "Question wording: Which comes closest to your view? 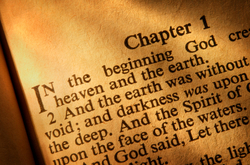 [HOLY BOOK]* is the word of God, OR [HOLY BOOK]* is a book written by men and is not the word of God? [IF BELIEVE HOLY BOOK IS WORD OF GOD, ASK:] And would you say that [HOLY BOOK]* is to be taken literally, word for word, OR not everything in [HOLY BOOK]* should be taken literally, word for word? *For Christians and the unaffiliated, 'the Bible' was inserted where indicated by [HOLY BOOK]; for Jews, 'the Torah' was inserted; for Muslims, 'the Koran' was inserted; for all other religious groups, 'the Holy Scripture' was inserted." This, it would seem, is a substantial challenge for the Arizona church. 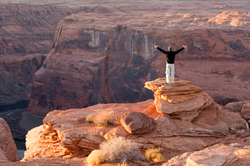 Nearly 88% of Arizona residents are certain, or fairly certain that there is a God. Yet, only 26% of them believe that the Bible is literally God's word, with and additional 31% of them not sure. I guess if I were a pastor, I would be working on making sure that the 31% in my flock were instructed with the truth. Here is a video, part of a three part series, that John MacArthur is currently doing on this very topic. Here is a post that I did back in February on the reliability of the scriptures. Dr. Wayne Grudem speaks on the issue here, here, and here. For the Christian, this is a critically important question. Let us all seek to work together to help the unsure 31% find out the answer. This is certainly a great place to start. 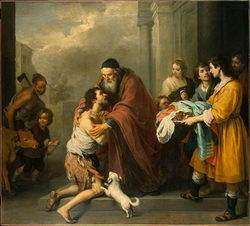 "The Return of the Prodigal Son" c 1667/1670 by Bartolome' Esteban Murillo. Having just completed my reading/review of A.W. Pink's "The Seven Sayings of the Saviour on the Cross", I have been giving some thought to the direction of my blog in the coming weeks. Primarily I have been reading/reviewing Dr. Wayne Grudem's Systematic Theology, reading/reviewing Christian Classics with Tim Challies, and studying/listening to Dr. Albert Mohler in the book of Matthew while I work out four days each week, as well as adding content from Jamie Rasmussen, my senior pastor at Scottsdale Bible Church. These studies have proven to give me plenty of material to record my faith journey along the way. As I began to contemplate the next chapter of Dr. Wayne Grudem's Systematic Theology, my heart was telling me to slow down. The last two chapters on Justification and Adoption have been incredibly enlightening. However, I desire them to be deeply life changing. I desire those gifts of God to take deep root in my life. Therefore, I am going to park the Systematic Theology bus for a spell and drink from the two refreshing wells of Justification and Adoption. I remember Wayne Grudem, in his recording on the Doctrine of Adoption, stating that the gift of Adoption is perhaps even more precious than the gift of Justification. I intend to explore that. I want to understand and experience what he means by that. Therefore, the Doctrine of Sanctification is going to have to wait a moment for my heart to catch up with my mind. I invite you to come along, and please, hit the comment button if you have something to add to my journey. The Seventh Word from "The Seven Sayings of the Saviour on the Cross"
"The Virgin Mary Swooning over the Dead Body of Christ at the Foot of the Cross", c 1710 by Pierre-Etienne Monnot. 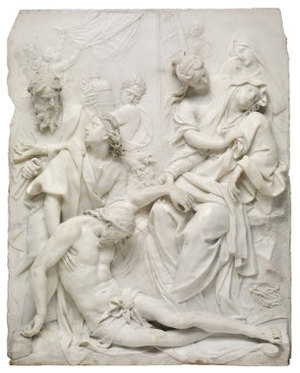 This is a marble rectangular relief depicting the Deposition, from the National Gallery of Art in Washington, D.C. This is my ninth and final post, joining fellow Christian bloggers in reading Christian Classics. In this series we are reading Dr. A.W. Pink's, "The Seven Sayings of the Saviour on the Cross". Luke 23:46, "Then Jesus, calling out with a loud voice, said, "Father, into your hands I commit my spirit!" And having said this he breathed his last." These were the last words of our Saviour in His incarnate state. In my reading of Pink's previous chapters the first thing I notice is that Christ called with a loud voice. As we saw earlier, Jesus, although still incarnate, was still in charge. It occurs to me that Jesus is also giving us an example of how to die "well". "Father" (our glorious benefit from adoption), "into your hands" (total trust), I commit (action on our part), "my spirit" (the real us that lives in these earthly bodies. "In you, O LORD, do I take refuge; let me never be put to shame; in your righteousness deliver me! Incline your ear to me; rescue me speedily! Be a rock of refuge for me, a strong fortress to save me! For you are my rock and my fortress; and for your name's sake you lead me and guide me; you take me out of the net they have hidden for me, for you are my refuge. Into your hand I commit my spirit; you have redeemed me, O LORD, faithful God." I have learned a great deal, from Dr. A.W. Pink, in these chapters. There is much to come back to and meditate in the future. I am also grateful for the blogging medium, whereby I will easily make reference to my notes, share them with friends and family and enter into dialog with new friends from all over the world. Pew Study: Do Arizona Residents Believe in God? There is a lot of information here that I will be digesting over the coming weeks. The first question that caught my eye was this: Do Arizonans believe in God? The first thing that we must consider, in looking at this data, is the character of the question itself. I believe that the question used in this survey is very telling of our nation's position on religious beliefs and practices. Question wording: Do you believe in God or a universal spirit? [IF YES, ASK:] How certain are you about this belief? Are you absolutely certain, fairly certain, not too certain, or not at all certain? Isn't it interesting the way in which they worded the question? Is belief in God and a "universal spirit" reckoned to be the same thing? Does this question not lump a Christian and a Buddhist (who have completely differing views on God) in the same camp? Is this question, the way it was worded, even relevant? I suppose a Christian could look at this data and conclude that most Arizona residents believe in God and walk away feeling fairly good about the number. However, it is critical that we understand that this sample only includes 578 people out of six million. Further confusing the issue is simply the way the question was worded. For the Christian, God is a real person not a "universal spirit". Therefore this response, for the Arizona Christian community, contains very little relevant information for us. Stay tuned for more analysis of this report as it pertains to faith in Arizona. 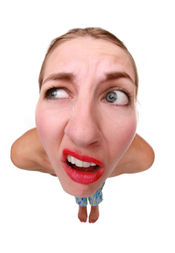 Are American "Christians" Biblically Illiterate? Have you ever watched the Jay Leno show when he does his "Jay-Walking" feature? Jay goes out onto the sidewalks of southern California and asks passersby questions that any third grader should be able to answer. I am constantly amazed at how many people don't know how many states there are in the United States, who the current president is, and many other seemingly simple questions. I just finished reading a summary of a recent Pew study on religious beliefs and practices. To be completely honest with you, I was deeply saddened when I saw the results of some of the questions. It is clearly apparent that many Americans have gotten so wrapped up in this life, and their individual pursuits, that the teachings of God have gotten morphed into relativism. It seems that if we don't really know what the answer is to some of life's more salient questions, then we get to make them up. Furthermore, in our arrogance, laziness, or perhaps just our busy lives we take these lackadaisical philosophies and build our lives around them! People! What is going to happen to you when you die? Why do you believe that? What is the foundation of your beliefs? Your quickly fashioned opinions don't count! Do you want to risk life after death with such impromptu thinking? This chart, from the Pew Study, shows that 70% of Americans believe that there are many ways to heaven. Fully 57% of Evangelical Christians hold the same belief! John 14:6, "Jesus said to him, "I am the way, and the truth, and the life. No one comes to the Father except through me." That is very direct. No one goes to heaven except for belief in Jesus Christ. Jesus speaks to this issue again in Matthew 7:13-14, "Enter by the narrow gate. For the gate is wide and the way is easy that leads to destruction, and those who enter it are many. For the gate is narrow and the way is hard that leads to life, and those who find it are few." Jesus is telling us here that many get it wrong! 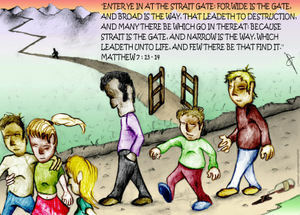 Most will go through the wide gate (many ways to heaven) and find only their destruction. Here is the real question. Do you really believe that God exists and that Jesus was His Son sent to earth? Do you really believe that Jesus Christ was God? Really? If so, dear friend, then read and understand the path that Jesus Christ proclaims. You simply can not afford to be wrong on this one!